The U.S. Centers for Disease Control and Prevention has reported a rise in confirmed cases of measles over the last two years--higher than any numbers reported in the previous two decades. The last decade has borne witness to several spikes demonstrating a troubling rise in confirmed cases of measles. The U.S. Centers for Disease Control and Prevention (CDC) has confirmed at least 228 cases of measles nationwide since January 1, 2019, with 22 cases reported in the past week. 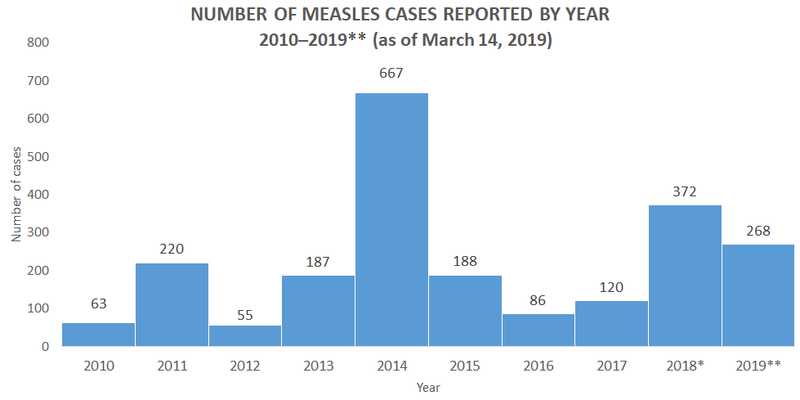 For comparison, 372 cases of measles were reported in all of 2018, which was the second highest total for annual cases in the past 20 years. An outbreak in New York that began in 2018 has been linked to 250 cases so far, with 11 new cases reported in the last week. An ongoing outbreak in Washington state has been linked to 75 cases since the start of the year. The outbreaks appear to originate from a region in the Philippines and returning U.S. visitors to that area who were not vaccinated against the virus. 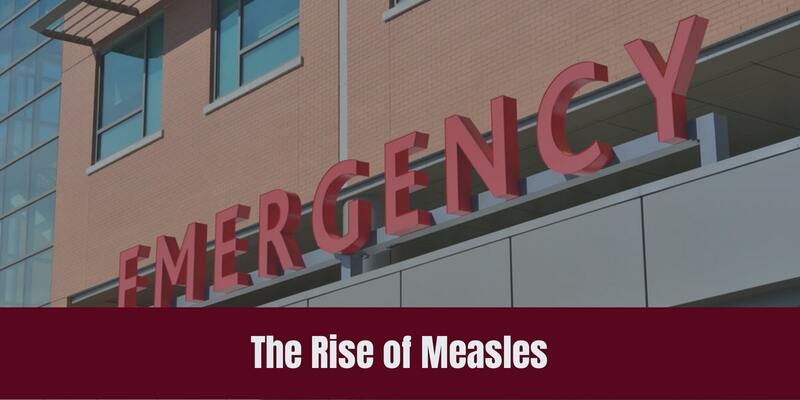 The current increase in measles cases is being driven by unvaccinated people, primarily U.S. residents, who got measles in other countries, brought the virus back to the United States and spread to others in communities where many people are not vaccinated. Many of the clusters in the U.S. began following travel to the Philippines where a large outbreak has been occurring since October 2013. What Happens When You Get The Measles? It is estimated that 90% of those who are not vaccinated against measles will acquire the virus at some point during their life, most likely when they are younger. Measles is a highly contagious respiratory infection that is caused by a virus. In fact, it is estimated that 90% of people who haven't been vaccinated for measles will get it if they are near an infected person! It is spread by respiratory droplets sprayed in the air when an infected person coughs or sneezes and because an infected person is contagious from about 4 days before the appearance of the typical rash, they can easily infect others before being aware of their condition. There is no cure, but treatment can be managed if the disease is caught early enough. The best way to combat the measles is to give your child the Measles-Mumps-Rubella (MMR) vaccine at 12-15 months, and then again at 4 to 6 years old. While that is not always possible, especially with the rising popularity of international travel tourism, a high-performance cleaning and infection prevention and control program is necessary. Regular surface cleaning and disinfection with green-certified products and microfiber mops and towels. The identification and routine disinfection of germ hot spots. Plenty of liquid hand sanitizer. Proper hand hygiene can do more than just about anything short of a vaccine to prevent the spread of infectious disease, and should be rigidly enforced for anyone coming into contact with an infected person to avoid spreading the contagion. Measles, once thought all but eradicated in the United States, has returned with a vengeance. Due to the length of time between outbreaks, many in the U.S. have forgotten the devastating effects of the virus and the horror it leaves in its wake. While vaccination cannot be guaranteed, a high-performance cleaning and hand hygiene program can do wonders for the prevention of the spread of germs and infectious disease. If you would like to learn more about the advantages to outsourcing your school or businesses cleaning or infection prevention and control initiatives to a vendor focused on cleaning for health first, contact us today for a free quote!